The trouble with water is that there is often too much of it, too little of it, or it is dirty and dangerous. These long-standing attributes of water are now joined by a series of pressures that are making water as a resource even more problematic. There are more and more people on earth, with more of them earning more money and demanding goods and services that require use of water, including of course food. The growing and adverse impacts of climate change provide a further, pervasive complication. In response to these developments, the PBL Netherlands Environmental Assessment Agency was tasked by various government ministries to assess the global implications for water resources and the challenges up to 2050, in effect defining the risks and where would they be felt most. 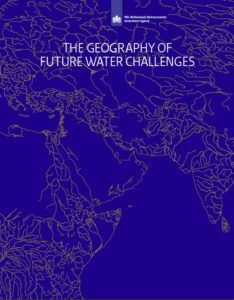 That report is The Geography of Future Water Challenges. As a delta region where almost every aspect of life is affected by water, the Netherlands certainly has the experience and expertise to undertake such a task. The PBL report relies on a set of infographics to depict the global trends in water-related issues. It reviews what pressures will build in creating stress on water resources across the globe up to 2050. Necessarily the analysis applies to wide regions rather than specific countries but there are valuable lessons on how the different regions will be affected and, equally important, how the effects in one place can cause ripples in other places. To focus that analysis, the report groups the challenges into four global landscapes: Drylands; Cities; Transboundary river basins; and Coastal zones and deltas. It also addresses some of the ways in which the stresses on water resources can be relieved and resilence can be built into economic development.What follows are just a few of the many takeaways from the report that will suggest lines of inquiry that are explored in greater depth throughout the report. The areas that are dry already face serious water-related stresses and by 2050, as a result of the spreading impacts from climate change, they will deteriorate further. Most regions of the globe experience water-related disasters that are well known. Droughts and flooding affect 160 million people, killing 13,500 each year. Flooding is the more damaging, costing US$31 billion per year. By 2050, there will be a 30% increase in the number of people exposed to flooding and 3-fold increase in economic damages, with much of this risk from river floods. Droughts are found in most regions but predominately in the southern hemisphere; flooding also occurs across the globe but affects more people in Southeast Asia. While these extreme weather events are visible, there is a more insidious problem: accessible freshwater constitutes a small fraction of all the water on earth. More than 95% of total water on earth is found in oceans, seas and bays, and it is saline water, while over 65 % of freshwater is found in ice caps, glaciers and permanent snow. So there is a paucity of freshwater to meet the needs of the growing population, which by 2050 will show a 25% growth in water consumption. And diminishing precipitation because of climate change will make freshwater even harder to get. Sharing this limited resource is becoming a major international challenge. While 20% of land is irrigated for food, 80% depends on precipitation. With climate changes affecting levels of precipitation, especially by 2050, the drylands will experience serious challenges in food production and maintaining limited livelihoods. While early warning systems have helped reduce deaths, growing populations that are increasingly vulnerable to flooding offset such reductions. For example, there have been advances in many regions in better water management but some areas, such as the Himalayan region and Indo-Gangetic Plain will not likely be able to overcome the fall in food and economy. Where the water-related stresses continue to deepen, those areas will be subject to further political and armed conflicts and migration. 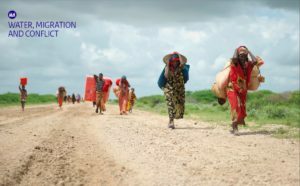 Migration from one place to another, within the same or different countries, is affected by a host of socio-economic and political factors, and water-related stress is one of those factors. While extreme weather events will result directly at times in temporary migration, more slowly evolving processes, such as sea level rise, can cause migration that is more permanent. Between 2000 and 2010, an estimated 40 million people migrated out of drylands, mostly in South America, Africa and Asia. If sea level rise is not mitigated, Bangladesh expects a migration of 20 million by 2050. General water stress can also create or exacerbate conflict between neighboring communities or adjacent countries, which conflicts are likely to increase by 2050. Africa and parts of Asia are hotspots for such conflicts based on water-related stresses, income per capita and governance issues. Moreover, “Food scarcity and peaking food prices due to drought have been shown to spark riots and conflicts, especially in urban areas with a large share of poor people.” At 83. As the PBL report indicates, much of the migration from troubled areas, whether because of water-related issues or socio-economic-political developments, will be to cities, in the same country or neighboring countries. The report plots out, in its infographics, where the growth and impacts on cities will occur. That influx and growth will exacerbate the already existing health risks from the lack of clean drinking water and inadequate or non-existent sanitation facilities or infrastructure. There will be huge cities, especially in the developing areas of East and South Asia and Sub-Saharan Africa. By 2050, Mumbai will be the world’s largest city with a population of 31.6 million. 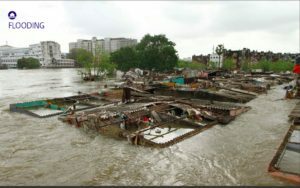 About 60% of that population in Mumbai will be located on flood-prone areas. By then, over 70% of the world’s population will live in urban areas on 0.5% of the global land. The report also offers a valuable analysis of the impacts on the cities of such migration and climate change. The report separates the cities/urban areas into “formal” and ”informal” settlements. The distinction is not particularly clear in the report, but it seems to indicate that formal settlements are built on landfill while informal settlements are built on riverbeds. At 50-51. In effect, the informal settlements are slums. Formal settlements are inhabited by people with resources — presumably money or political power — to build the infrastructure in drinking water and sanitary facilities to meet their needs. 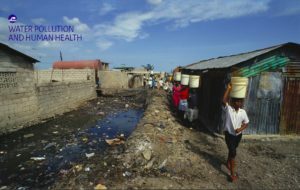 In informal settlements, or slums, drinking water is scarce and sanitary conditions are filthy with little or no wastewater treatment and latrines representing as good as it gets in some locales. In developing countries people in informal settlements within cities will constitute 50% of that population. The expansion of hydro power to satisfy economic and food developments will pose difficulties in preserving the sediment flow along rivers below these dams. These sediments are critical to maintaining ecosystems and flood protection efforts. Of course, displacement of entire communities will also rise. As a dam in one country can, and will, affect the water resources of adjoining, especially downstream countries, there has been a need to collaborate between the countries on water issues and much has been achieved in this area. However, as the water resource gets more scarce, the political tensions will rise. It is becoming a cliché that the next wars will not be about oil, but water. More people with more economic assets will migrate to attractive and productive coastal areas. By 2050, large concentrations of people and economic value are projected to form flooding hotspots in China, Southeast Asia, South Asia and Sub-Saharan Africa. In 2010, there were one billion people living in flood-prone areas; by 2050 there will be 1.6 billion. That concentration will have several consequences. Obviously the more economic assets in flooding hotspots, the greater the costs of damages. But the sea level rise will not only destroy the built environment, it will impact soil subsidence and salinsation, which will affect food production and drinking water availability. And water pollution in cities will increasingly affect human health, causing the highest number of casualties of all water-related impacts.